The other item needed, dried apple slices, I chose to make at home instead of trying to find somewhere. I presume many such dried items are possibly laden with odd additives. Since we did have some apples on hand, I thought why not. 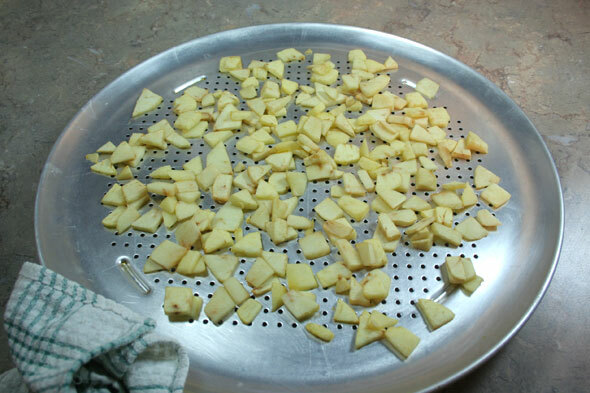 Several days ahead, I began with making the sliced and dried apples. The recipe wants 136 grams of “apples, sliced and dried”… Ummm… Is that 136 grams of apples which are then sliced and dried or 136 grams of dried apple slices? I decided I’d go with the latter, since this would at least give me enough apple bits even if it turned out it was the other way. I took two large apples, a Granny Smith and a Spartan. Peeled and sliced, they went onto a tray and into a 250ºF oven for about 2 hours, getting checked every half hour. By 1:30, they were pretty close so I pulled them out. They were slightly leathery and a golden tan colour. Then I weighed them: barely 30 grams. Shoot. I repeated the process the next day and this time used four more apples: three Granny Smiths and one Spartan. 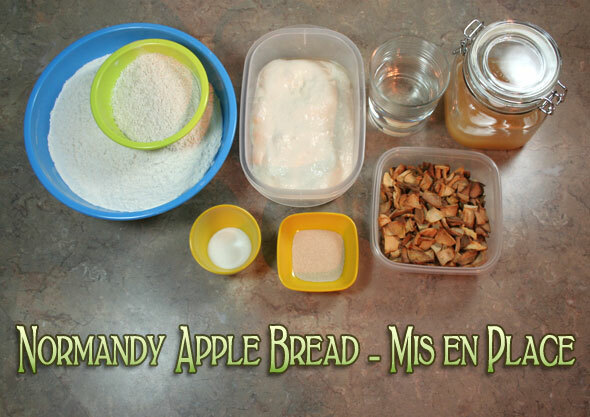 This brought the total dried apples to 120 grams which I decided was close enough. Six apples in total would have to do. One day before the expected baking, I made up my levain. I found that my starter had gotten a bit of frostbite in the back of the refrigerator. I decided to give this puppy a couple of feeds and hope this didn’t affect it too badly. Since I wasn’t going to get to the bread until the next day, The levain was made with added salt (6 of the total 17 grams required by the recipe) in order to slow it down and make it last until the next morning. This worked nicely. And the Mother starter seemed to have survived the slight freeze as well. Good thing I have some dried as back up, though, for just such emergencies! Finally, I was ready to tackle more bread so I got my Mis en Place in place. Bread flour and a little Whole Wheat flour, our levain build, water, the tasty apple juice standing in for cider, salt, a little yeast to help things along and the apple chips. If you would like to make this recipe, you can find it in Jeffery Hamelman’s book Bread: A Baker’s Book of Techniques and Recipes but it is also found, slightly modified, over on Mellow Baker member Cathy’s blog, Bread Experience. 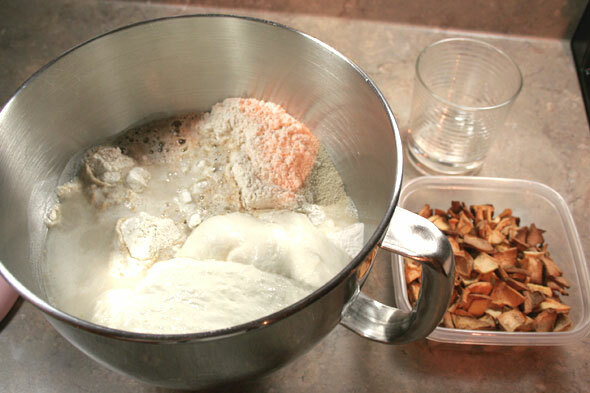 To get this dough together, we add all ingredients, except the apple bits, into the mixer and mix with the paddle until the dough is well incorporated. I had problems at this point (already!) and had to constantly stop and scrape the dough down as it insisted on climbing right over the paddle and into the spring mechanism. I also held back about 3 or 4 tablespoons of the water as the recipe notes one may have to adjust the hydration. Man, that made for stiff dough! 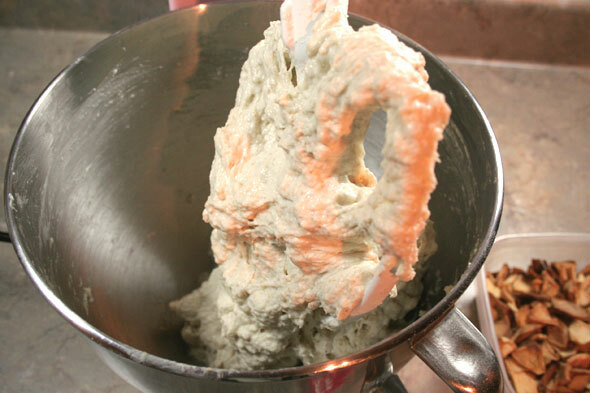 So once I switched out the paddle for the kneading hook, I added some of the water. 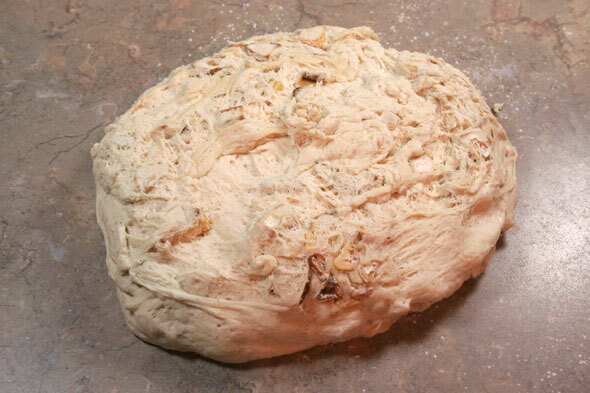 And probably should have held some back because suddenly, the dough got very wet. 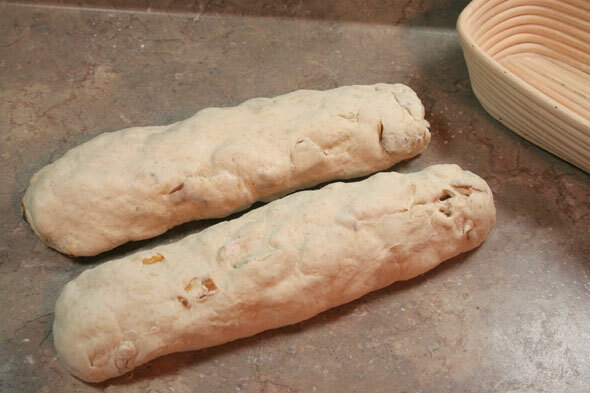 I adjusted by adding a few tablespoons of flour as the dough kneaded up. 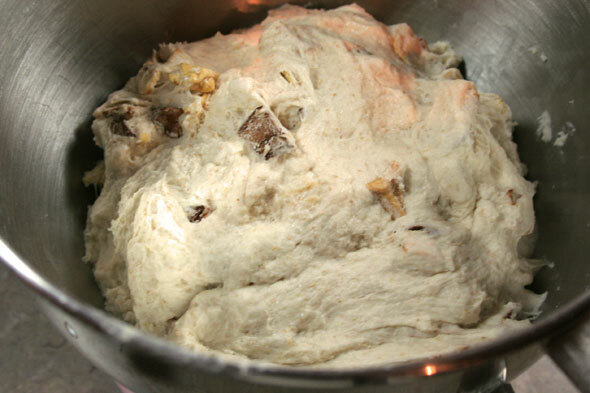 Eventually, the dough began to look like normal, handleable dough. Once the dough seemed to be behaving, the apple chips go in for the last minute, just until they’re evenly incorporated. The dough is now ready to go into the oiled bowl for bulk proofing, estimating between 1 to 2 hours. 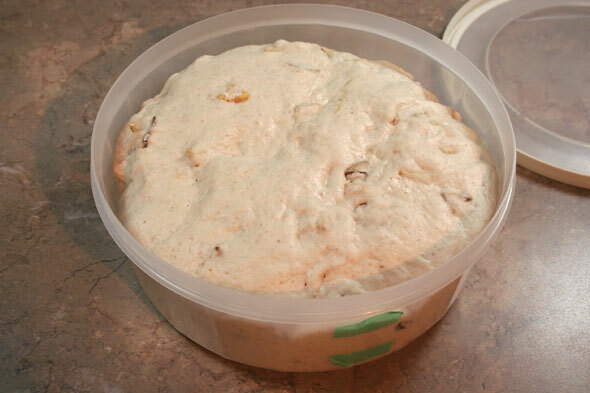 90 minutes later, this dough was doubled and ready. I turned it out onto a lightly floured surface and divided it in two then snipped or added from the other half to get relatively equal weights which, in my case, was around 850 grams. Each piece was shaped into an oblong was transferred to rice-flour coated cane baskets. I haven’t made bread with such big lumps of stuff in them before and these apple pieces seemed to be a bit of an oddity. Still, I managed to get the top surface looking relatively smooth without big apple chunks poking out to burn, even if the seam side, facing up now, was less than gorgeous. These baskets were then slipped into a plastic bag and left to proof for 1 to 1.5 hours after giving the tops a light brushing of veg oil sto avoid sticking. 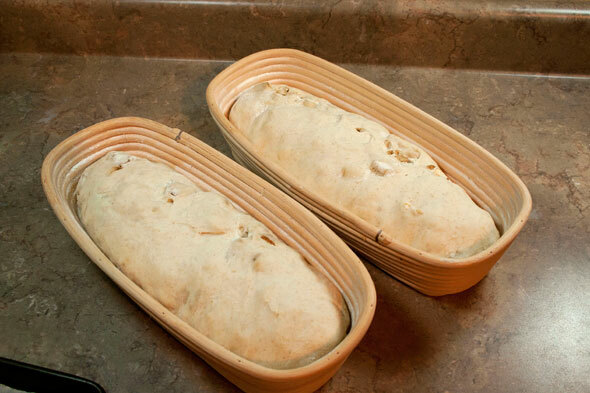 After 1.5 hours, the loaves seemed to have doubled or nearly so. 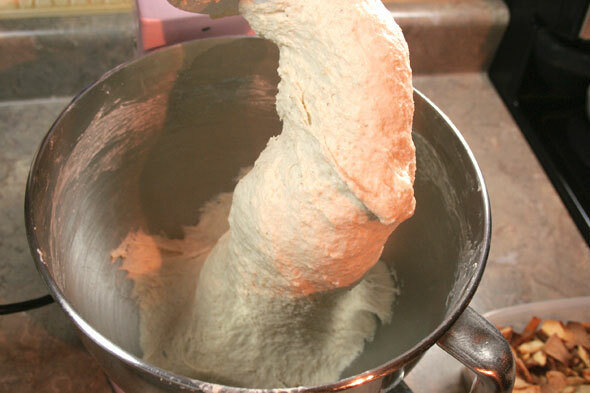 A poke test showed the dough was willing to spring back slowly. I hoped these would show a fair amount of oven spring. 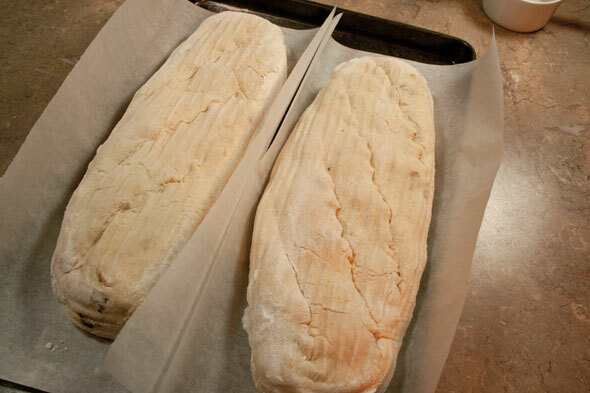 Placing a piece of parchment paper over each to allow individual manipulation in the oven if needed, the loaves came out of the baskets cleanly. I placed them on a baking pan and slashed them in the typical diagonal style. Not shown: I gave the tops of the loaves a very light mist and the inside of a large disposable aluminum turkey roaster as well before covering the loaves. 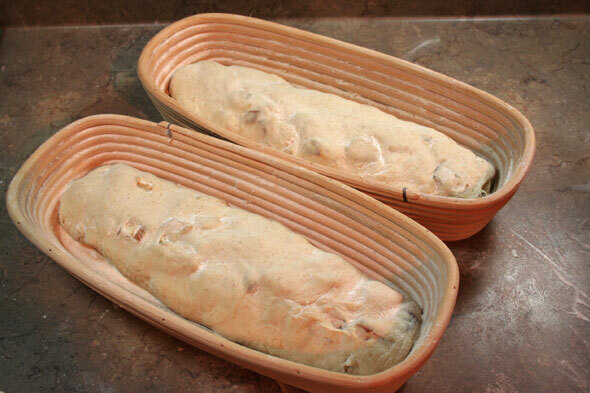 I wanted the loaves to get plenty of trapped steam so they could expand easily. Into the pre-heated 450ºF oven they went and, at the 15 minute mark, the turkey pan was removed, the oven temp lowered to 420º and the loaves were left for approximately 25 more minutes to brown up and finish baking for a total of 40 minutes. I set the timer to 15 more minutes however, wanting to make sure I was watching for the final 10 minutes. I should note that when I did remove the turkey pans at 15 minutes, the loaves were still very pale but had not increased in size very much. I had expected and hoped for much better oven spring, particularly allowing for both starter and commercial yeast and the added sugars from the apple and juice included. None the less, I waited unti the buzzer went off at 30 minutes in. At the 30 minute mark, I pulled one of the well browned loaves out to check the internal temp and saw that it had already reached 205ºF, even while short from the expected bake time of 40 minutes. So out they cam immediately. Turning them over, I saw that the bottoms were very dark. The top crust was very solid, although the sides were still quite soft. So somehow, the loaves had baked a little too hot and too fast. And the oven spring had not really shown up much. Regardless, they smelled wonderful and after letting them cool for 20 minutes (which was extremely difficult) I finally sliced into one loaf to look inside. Slicing the loaf, I noted the crust had softened slightly from very hard to just quite hard. I hope that by sitting and allowing the inside moisture to move outward, the crust gets a bit softer still. There had been some expansion of the slashes, so clearly there was some oven spring evident. However, the loaves were both a little small and rather dense. Tasting one of the slices… wow. In spite of these issues I was running across, the bread was very good. 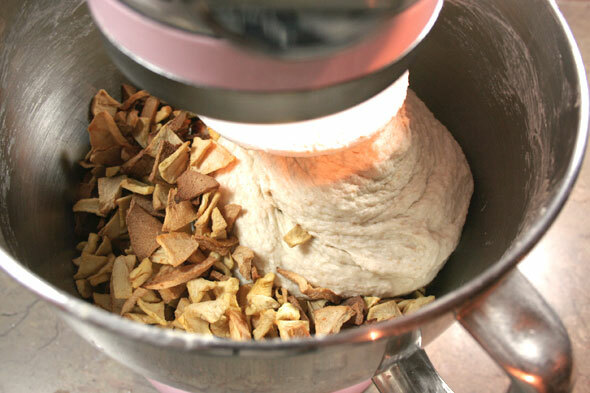 The slightly brittle apple chips had absorbed some of the dough’s moisture and were actually quite flavourful and were plentiful enough to hit one or two in every bite. The apple flavour from the juice is quite distinct in the crumb which, compared to the results I saw other Mellow Bakers getting from this recipe, did not end up as open as can be. The crust seems to be softening up as the moisture from inside the bread works its way to the surface. This loaf is taking a bit of time to adjust itself, I won’t complain. A little butter while still warm made this a success in spite of the flaws. It is a sweet bread and could possibly pass as “desert”. It would certainly make for great bread pudding if there is any leftover. This bread may need a second try to see if I can overcome some of the problems and get a lighter, bigger loaf out of it. This looks beautiful! I was surprised to really like this one, too, but I wish I’d thought of bread pudding for the leftovers…what a great idea. 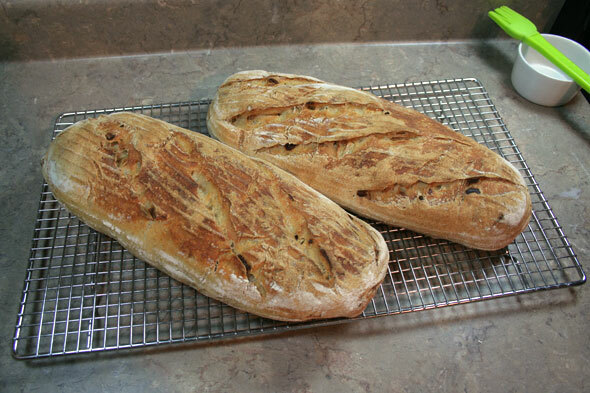 (Yes, I ate both loaves on my own… Over numerous days, mind you, and freezing the 2nd while polishing off the 1st). Boy, do those look good! 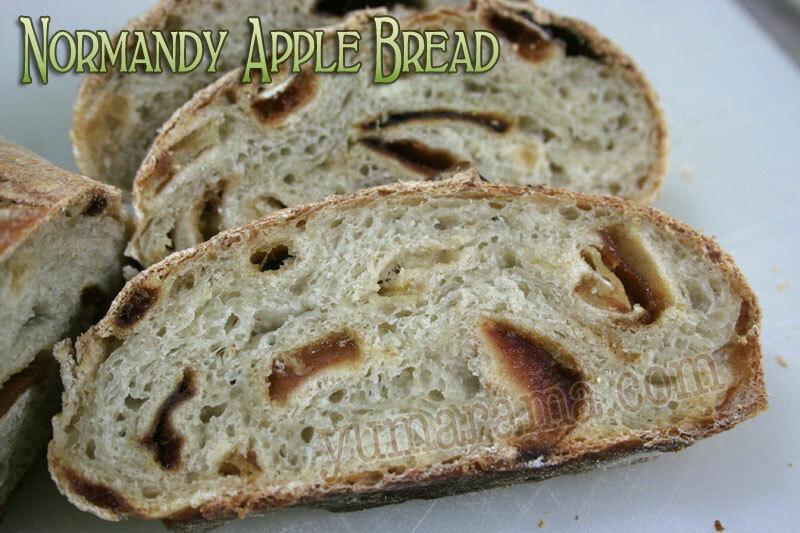 I like the crumb and you can really see the apple pieces in the slices. I’d put a thin coating of no-sugar added apple butter on one!! Thanks Melanie! I didn’t chop the apple slices too small for exactly that reason. Each full slice (cut thin) was then cut into three so they were still decent sized even after drying and shrinking. 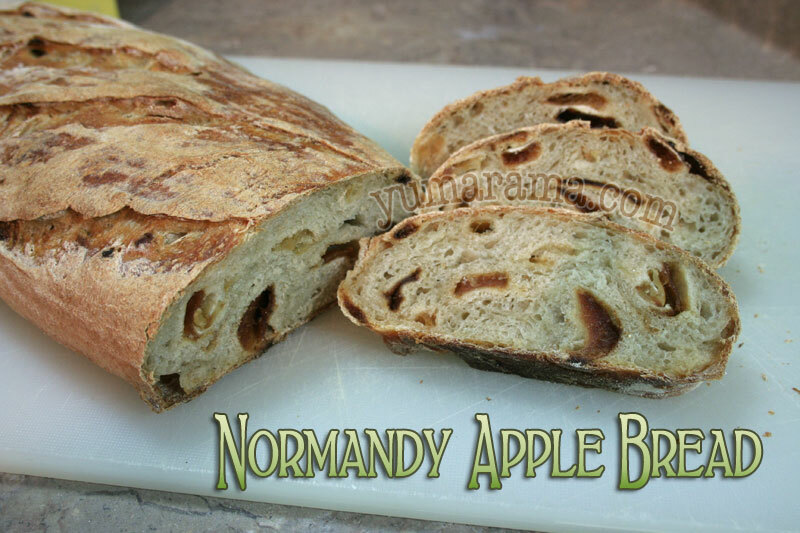 It’s near impossible to not get a good bit of apple slice in each bite and that “Pow!” of concentrated apple flavour, although the apple juice also helps make even the crumb really flavourful. Fabulous looking bread. You don’t need to worry about starter getting frosty — it can be frozen and resusitated. 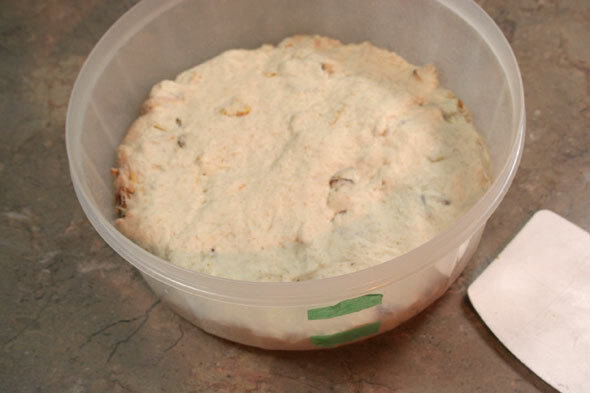 Simply put it out on the counter, lift the lid so it doesn’t explode, bring it to room temp. and feed it. 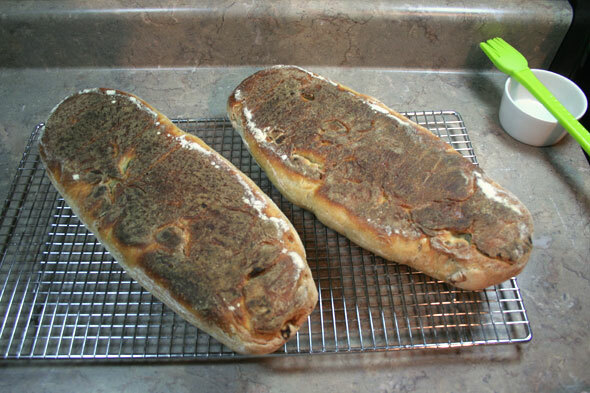 I would bake the bread at a lower temperature so it gets the oven spring. The oven being that hot caused a lack of spring. Perhaps try 400 and then bring it down to 375 . . . but I personally bake most of my bread at 350-375.